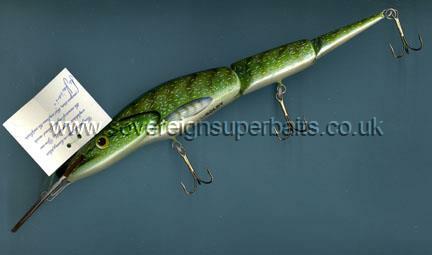 Goldy Pike: A double-jointed handmade, hand-decorated 12” Pike. Part of a limited edition of 150 pieces world-wide. Each lure comes with a numbered certificate attached. Encased in a handmade solid walnut presentation box. Each lure is a result of 20 man hours from 3 different people. There are at present four more lures in the sequence which hopefully we will obtain at bimonthly intervals. These are obviously an indulgence for the avid collector.